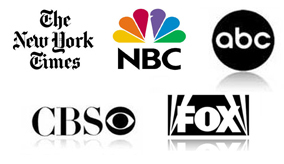 Warning- Some of the pictures below are graphic in nature! 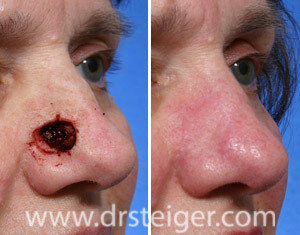 Goals: Reconstruction to repair a large defect of the right nose after MOHS surgery . 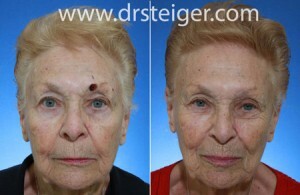 An interpolated forehead flap was performed in two stages. 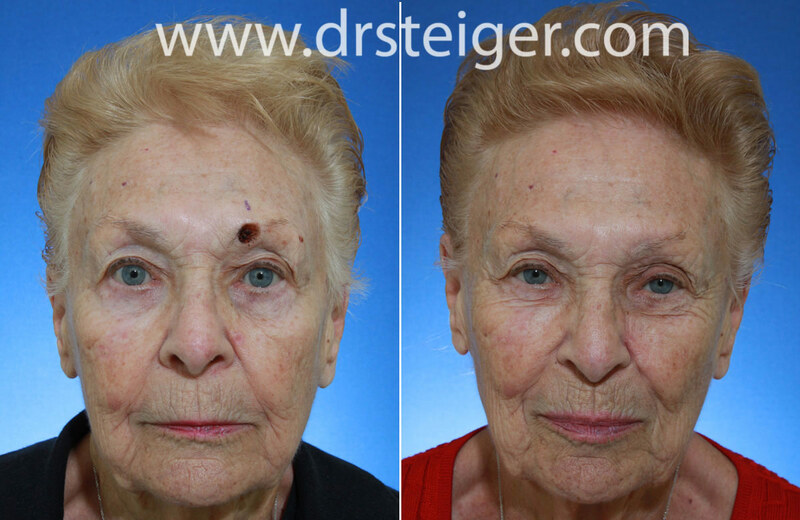 Goals: MOHS surgery was performed on her upper eyebrow to remove a basal cell skin cancer. 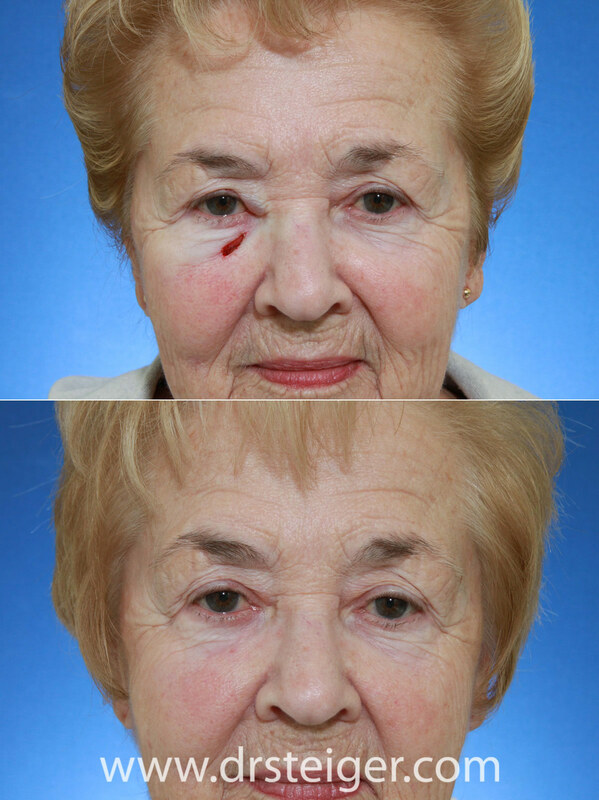 A local flap was performed to repair the eyebrow, while maintianing the shape and contour of the brow. 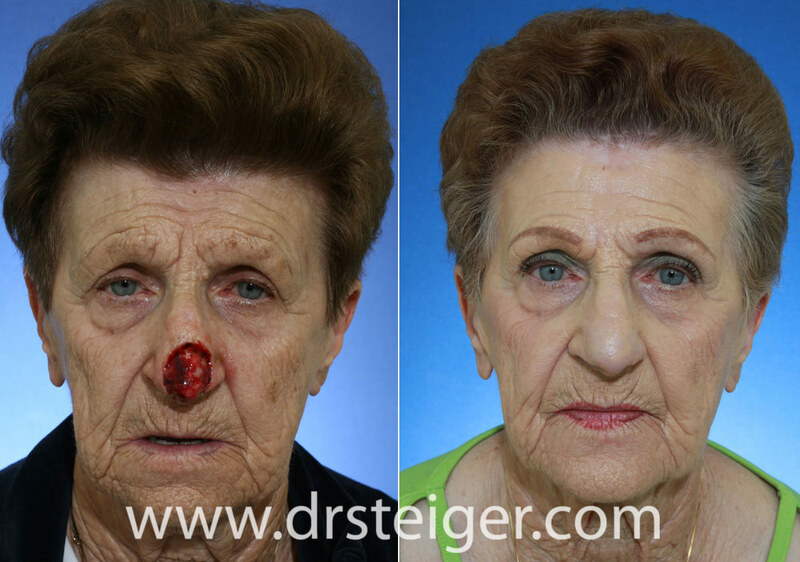 Goals: This patient had nose reconstruction to repair a nasal defect involving the nostril margin and the cheek. 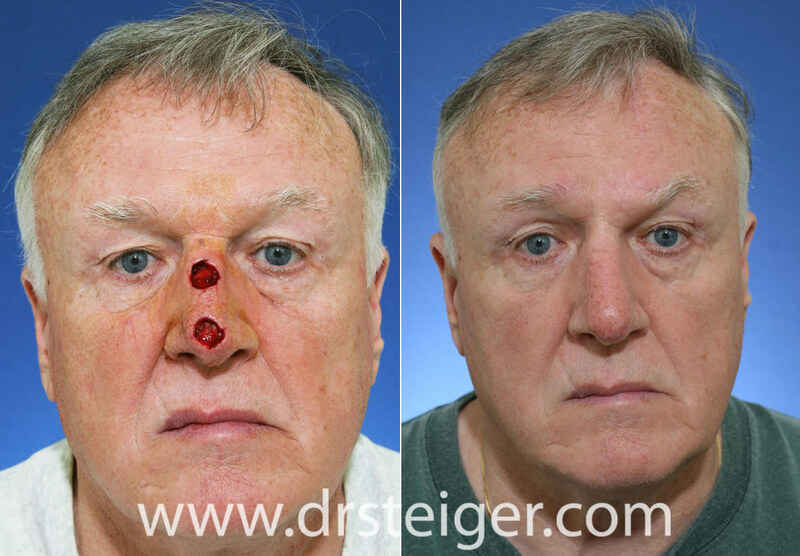 The nostril (nasal ala) was repaired with a 2 staged interpolated cheek flap (nasolabial flap) procedure. In the first stage of this facial reconstruction, skin and soft tissue from the cheek was trasferred to the nose in order to replace the missing tissue. 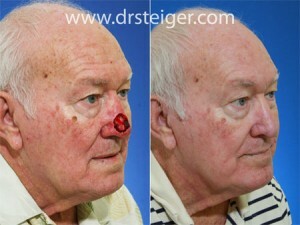 His own cartilage was used as well, in order to maintain the contour of the nostril and prevent collapse of the ala. The second stage was performed 3 weeks later in order to detach the flap and to recreate the transition between the cheek and the nose. 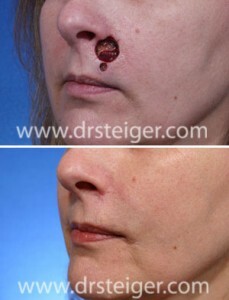 Goals: A paramedian forehead flap was used to repair this large nasal defect created after the removal of a melanoma from her nose. The first stage was performed to transfer skin and soft tissue from the forehead to the nose. 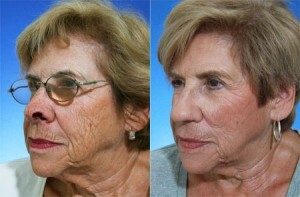 In the second stage of the procedure, 2 weeks later, the connection was detached to restore the forehead into position. 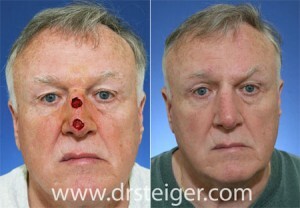 Goals: The defect of this man’s nose extended deep to the nasal cartilage and bone. 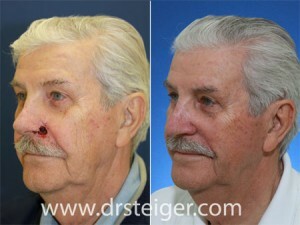 A two stage forehead flap was performed to reconstruct this man’s nose. 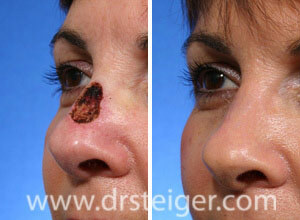 Goals: A skin graft was performed on this patient’s nose in order to repair a defect after MOHS surgery. The contour of the skin graft was then improved with a planned dermabrasion in order to blend the graft with the surrounding skin and fine tune the final results. Goals: A transposition flap was performed to repair this nasal defect. All of the incisions for repair were hidden within the nasal creases and transition points to camouflage them, making them imperceptible. 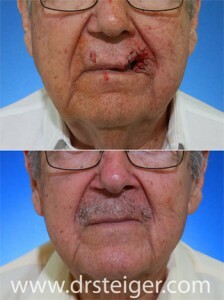 Goals: A modified V to Y Island flap was performed to repair this upper lip defect. 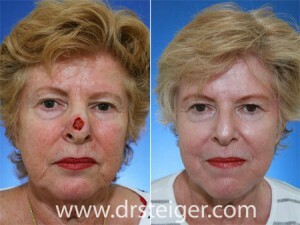 All of the incisions were hidden within the natural creases of the face. Goals: This patient had a full thickness (through and through) defect of his upper lip after MOHS surgery to remove a lip cancer. 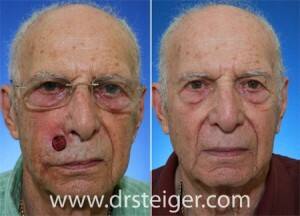 Reconstruction of the lip was performed with a two staged Abbe-Estlander flap. He is seen here 6 months after repair and has normal lip function. Goals: MOHS reconstruction with an island pedicle flap to the upper lip was performed in order to repair this defect. 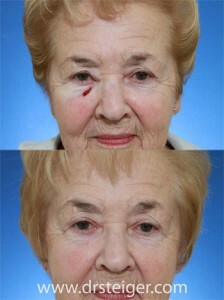 The flap incisions are all hidden within the natural creases of the face. Goals: A local flap to the lower eyelid was performed to repair this defect created after skin cancer removal from MOHS surgery. 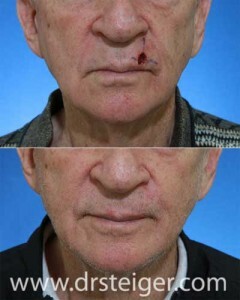 Goals: A local transposition flap combined with a Z-plasty was performed in order to repair this gentleman’s cheek defect. Goals: This patient presented with a through and through defect of the nostril margin. A staged cheek flap along with an ear cartilage graft was performed in order to repair her nose. 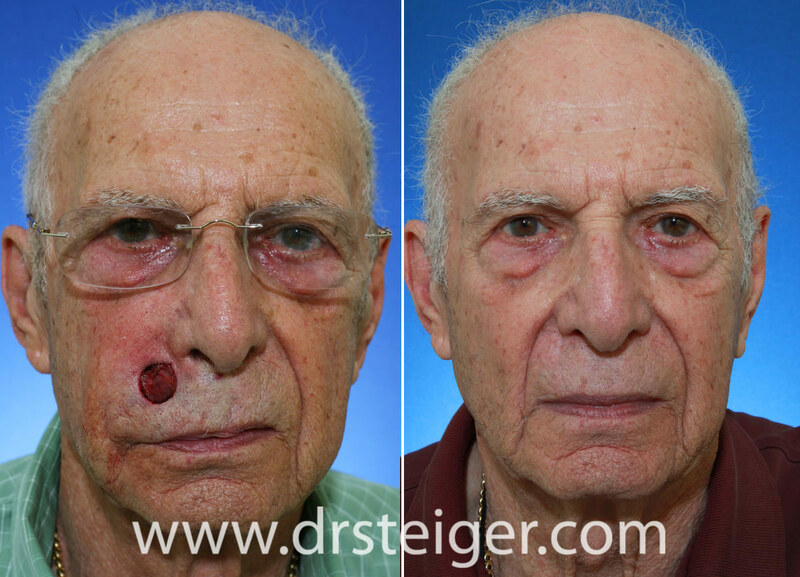 Goals: This patient had MOHS surgery for skin cancer of his nose. 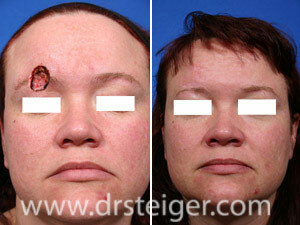 The MOHS surgery was repaired with a two stage MOHS reconstruction procedure called a forehead flap. 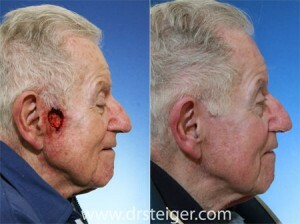 He is shown here 3 months after the MOHS procedure and reconstruction was performed.